This spatchcocked Thanksgiving Turkey is the perfect combination of crispy skin and juicy meat. In a very large stock pot – first add the salt and sugar. Then add all of the aromatics: 2 sliced lemons, 1 sliced orange, 2 sliced limes, garlic, 8 sprigs of rosemary, 20 sprigs of thyme, 2 onions, peppercorns and parsley. Add water and mix well, until salt and sugar are dissolved. Then gently place turkey into brine. If need be, add more water until turkey is completely submerged. Refrigerate for 24-48 hours. 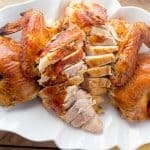 Spatchcock the turkey - After turkey has been in brine for at least 24 hours, it’s time to spatchcock the bird – which basically means “remove the backbone and lay flat.” I find it easiest to cut out the backbone while the bird is still in the stock pot, using sharp kitchen shears. Once backbone is removed, transfer the bird to a large colander so that any excess liquid can fully drain off. Discard the brine. While the bird sits in the colander, remove the wishbone. Preheat oven to 425 degrees F. Transfer the turkey to a large cutting board and place breast side up. With a firm press of the palm of your hand, break the breastbone, so that bird can lay flat. Line a baking sheet with 2 thinly slice oranges, 1 sliced onion, 10 sprigs of thyme, and 4 sprigs of rosemary. Flip the bird and season the non-skin side generously with salt and pepper. Then transfer the bird to the baking sheet on top of aromatics with the skin side up. Fold out leg quarters so that as much skin is exposed as possible. Season the skin generously with salt and pepper. Bake the turkey for 30 minutes. Meanwhile… gently melt butter in with one quartered onion. After 30 minutes of roasting the turkey, dip 4 large pieces of cheesecloth in the butter and cover the entire skin surface of the bird. Return the turkey to the oven and bake for 1 more hour, and basting the outside of the cheesecloth every 30 minutes. Now that the turkey has roasted for 1 1/2 hours, remove the cheesecloth and insert a meat thermometer into the largest part of the breast. Continue cooking until temperature is between 160 and 165 degrees F. Remove from oven and let rest for at least 20 minutes before slicing. As the turkey rests, the temperature will continue to rise.